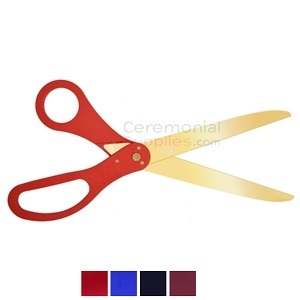 The Ceremonial Golden Blade Ribbon Cutting Scissors feature gold-toned blades made from stainless steel with handle color options of red, blue or black. The total product length is 30 inches. 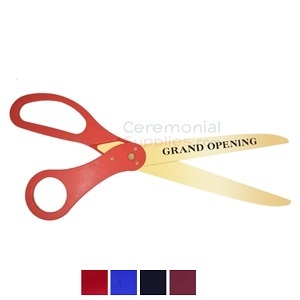 The Pre-Printed Grand Opening Golden Scissors measure 30 inches in length. They have a printed message that reads ‘Grand Opening’ across the blade. To Add a Logo, Click Here. The handles are available in three different colors: red, blue, and black. 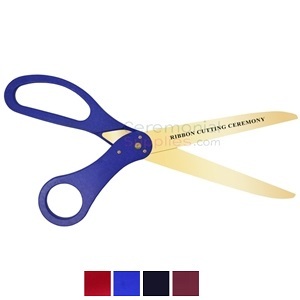 Pre-printed Ribbon Cutting Ceremony Golden Scissors are all about your ceremony. The text stamped across the golden-toned blade reads 'Ribbon Cutting Ceremony' to add a visual element to your stage. Handle color options include red, black and blue.